Decade have built a solid name for themselves over the last 12 months, so it seems fitting to release an album good enough to set them up for another big year. Good Luck is the first British album this year to deliver on the hype surrounded it, discounting Wishful Thinking by Neck Deep, which seemed to take a step backwards. In contrast Good Luck is a triumphant step in the right direction towards bigger and better things, taking some of the tracks that defined the bands final few months of 2013 and slotting them in amongst some of their most ambitious and exhilarating anthems to date. Good Luck is jam packed with short, snappy and fairly contagious pop-punk songs with hints of heavier influences. Across the albums 27 minute length (38 on the deluxe) the Bath-based band churn out hit after hit, from the subtle guitar intro of the opening title track to the emphatic ending of closer ‘Fake Teeth’. It’s excellent from start to finish, despite occasionally sounding a little repetitive. 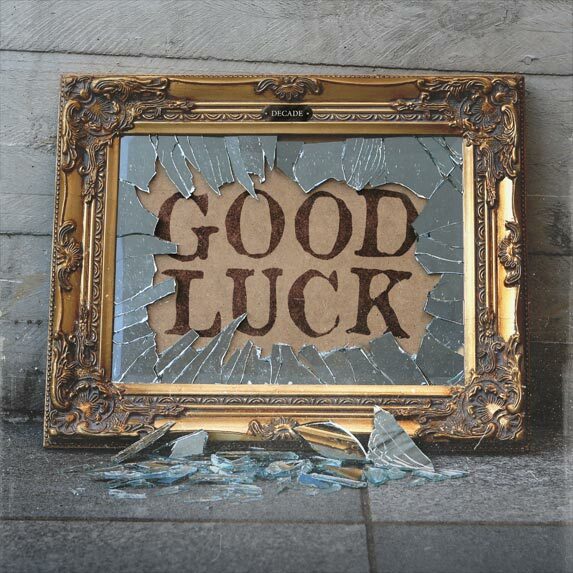 Good Luck is an album destined to satisfy anyone who likes the genre as well as those who prefer an album with a bit more venom than the typical sunshine sounds of the genres most well-known. Such venom is found in abundance on single ‘Callous’ on which guitarists Joe Marriner and Connor Fathers churn out meaty riffs and sparks of melody whilst Dan Clarke delivers clever drumming. The instrumentals combined supply a solid backbone for one of the albums catchiest and punchiest tracks. What’s most noticeable, and admirable, about Good Luck is that it pulsates with youthful energy which has been pumped into near enough every second of the record, and as a result it’s a listen that never really relents, with tracks like ‘Woke’ diving straight in. Vocalist Alex Sears falls halfway between Mike Duce (Far-Q era Lower Than Atlantis) and Jim Adkins (Jimmy Eat World) and his voice is untypical in the sense that it isn’t the most melodic or inspiring, but it allows Decade to function much better as a unit, and it shows throughout their debut. Tracks like ‘Home Bound’ and ‘British Weather’ sound absolutely huge, whilst tenth track ‘Fake Teeth’ dials it down a notch, opting for a more subtle approach whilst still packing a punch via its towering chorus. There’s a good bit of variety on Good Luck and there’s lots of experimentation from an instrumental perspective. The band has honed their songwriting craft to perfection, and tracks like ‘Fool’s Gold’ offer up delicious hook after delicious hook. It’s incredibly impressive for a debut album, because Decade seem to possess a confidence that suggests they’ve well and truly found their feet. It was hinted at on last years ‘Brainfreeze’, which remains one of the catchiest tracks on Good Luck, as well as one of the best lyrically, but Decade have stepped up their game and delivered one of 2014’s first real contenders. Lyrically the album is generally good, although lines like ‘today I paid the biggest price, that’s what you get for being nice’ sound a little weak, especially when paired with the bounce that ‘Homebound’ carries. It’s the only real area for improvement, and it suggests that maybe Decade still have some room to mature. The deluxe edition of the album comes with two bonus tracks as well as an acoustic version of singles ‘Brainfreeze’ and ‘British Weather’, both of which are interesting and worthy takes on the studio versions. Extra tracks ‘Thursday’ and ‘Who Knew? are also well worth the money, with the former being one of the albums best tracks, and one which probably should have ended up on the standard version of the album. I’d recommend the deluxe version, if only to expand an already great album. Decade have definitely delivered on their debut, and although it’s not perfect Good Luck sees the band develop their songwriting skills amongst other aspects, and as a whole it’s a great debut from one of the UK’s most promising artists. I can only see them going from strength to strength this year, and if Good Luck is the first step of a new journey then the only way is up. If 2014 is the year that Decade explodes then they could potentially own it, with Good Luck being a brilliant way to start it.